Drawn from a research study of university students with dyslexia, this book presents transcripts of in-depth interviews in which students give compelling accounts of their experiences of growing up with dyslexia. The book is intended to help students or prospective students with dyslexia and also the people teaching them. Barbara Riddick is the author of Students and Dyslexia: Growing Up with a Specific Learning Difficulty, published by Wiley. 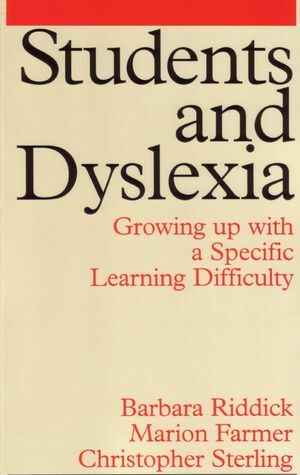 Marion Farmer is the author of Students and Dyslexia: Growing Up with a Specific Learning Difficulty, published by Wiley. Chapter 2 An overview of the Study. Chapter 12 Summary and conclusions.